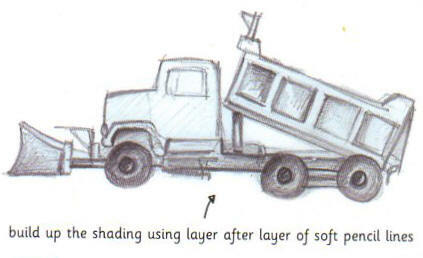 Now let’s draw a cement mixer truck. The trickiest part is the cement mixer itself on the back of the truck. It looks a bit like a diamond or an ice-cream cone lying down. Start with three circles joined together by a straight line. Draw a cab with a sloping bonnet. Then starting above the middle wheel draw an eight-sided shape as shown – the sides are all different lengths. 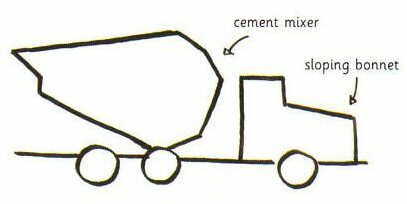 Use this picture to help you add some more details to our cement mixer then colour it in. Now try a pencil sketch of a cement mixer. Draw a rough outline of your cement mixer first. When you are shading take a break every now and then so you can study your picture to see which parts need more work.